It’s finally Winter. Even though it’s been feeling like Winter for quite some time already. Every year at this time, it reminds me just how freezing it is to work next to fridges and just how warm a good comforting bowl of soup can make me. 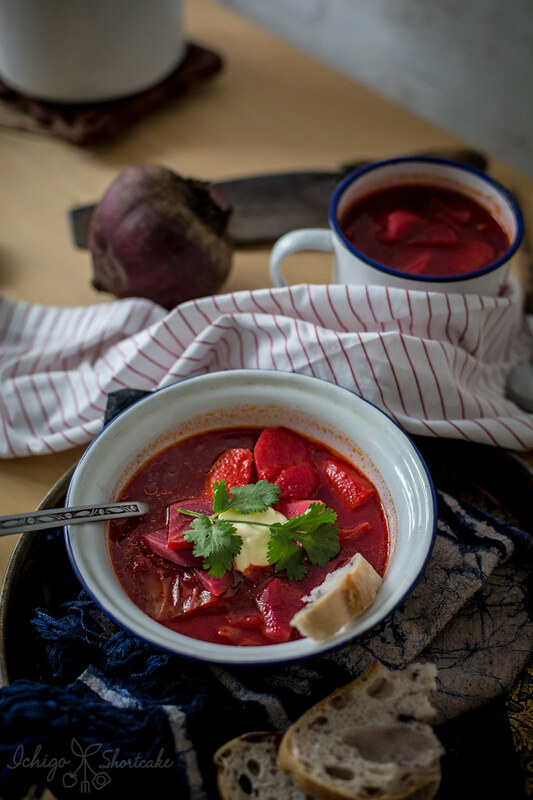 A few days ago, we made borscht, but probably not completely like you know it. 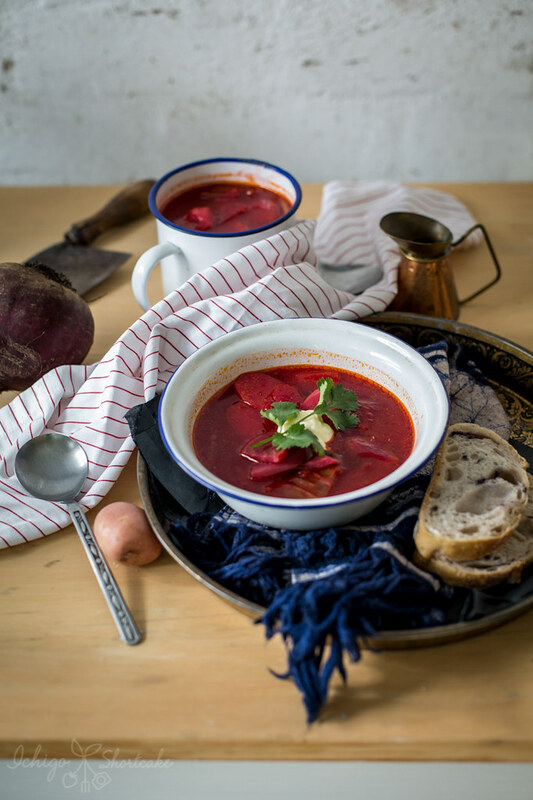 For those of you who don’t know, borscht is a Russian soup which is usually made with beets, potatoes, cabbage and beef. As China is quite close to Russia, back in the cultural revolution days, people ate a lot of Russian food, like the borscht. In China, there’s a soup called luo song tang (罗宋汤) which is Russian borscht translated and over the years of consumption in China, it has changed significantly. Since I was a child, my mother would make this soup. The funny thing is, it doesn’t include beets at all. What makes it the red colour is tomatoes. I have been eating this soup and loving it since I was a child without even knowing where it came from. Yuye’s dad makes it quite differently, it’s closer to the original style than my mother’s. It uses beets like the original recipe which gives it that deep red colour and sweet fragrance. 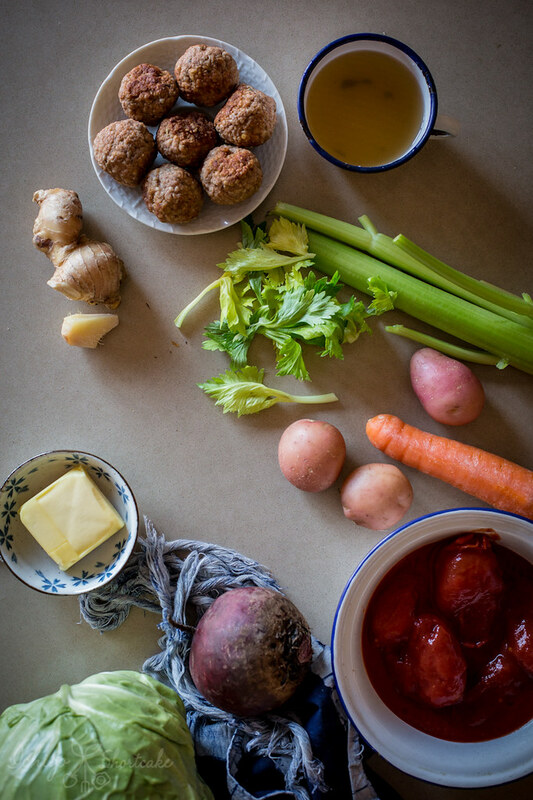 Now when I took the ingredient photo, I put in meatballs thinking I was going to put meatballs in the soup. But it turned out totally delicious without them so the recipe and rest of the photos turned into a vegetarian one. You can put meatballs in the soup if you like or with stewed beef, but I enjoyed it without any meat. I will make my mum’s version some time too, and then you can make a comparison of the two. In the mean time if it’s cold where you are, this soup will surely warm you up and provide you with plenty of nutrition. If it’s hot where you are, you can still enjoy this soup as it’s not too heavy. 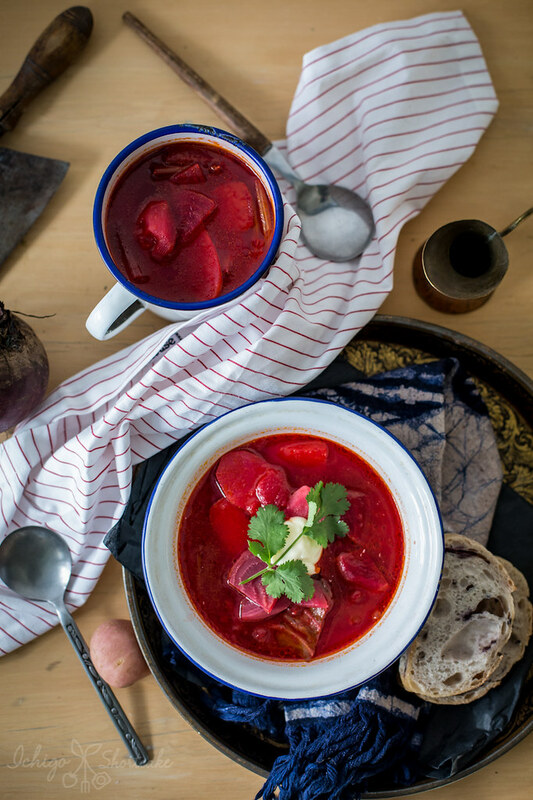 A rich and hearty vegetarian Russian soup that's beautiful to look at and delicious to eat. This version has a slight Chinese twist. Fill a large pot half way with water. Bring to a boil and put in the beets. Cook for about 15 minutes or until they've dulled in colour. Add in the potatoes, carrots, celery, vegetable stock and butter and cook for a further 15 minutes. Add in the cabbage and can of tomatoes, salt and pepper to taste and cook for a further 5 minutes until cabbages are cooked. Transfer to bowls and top with sour cream. For a vegan option, omit the sour cream and butter. You can add meatballs, sausages or stewed meat to this dish to make it meaty and more filling option. I love borscht! I’ve never had the Chinese version but I’m pretty sure I’d love that too. It looks so good and I think the meatball addition is great. A meal in a bowl. I love boracht so I woyld be interested in trying this Chinese version. What a fun twist on this soup! Really like the ginger in this — such a terrific idea. Thanks! That’s quite healthy! I must be including it in my healthy menu and hope my guests like it!